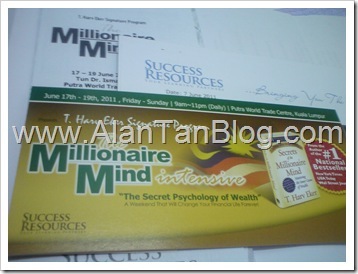 I got my FREE ticket to T Harv Eker’s Millionaire Mind Intensive program which is held in Kuala Lumpur from 17 to 19 June 2011 at PWTC, Kuala Lumpur via post. Since my ticket is free and on General Seating, no material was included. I guest the material would be the same like in the past year. It’s good to go back to T Harv Eker’s Millionaire Mind Intensive program in order to refresh ideas learned and networking purposes. You’ll see and meet a lot people from all walk of industries range from Direct Sales, Multi Level Marketing, Unit Trust, Insurance Agents to Sales and Marketing. What I understand for this year T Harv Eker’s Millionaire Mind Intensive program, T Harv Eker would NOT be here as it was conducted by his best student. My friend who attended the Quantum Leap programme, highly recommend it to everyone who got budget. See you at T. Harv Eker’s Millionaire Mind Intensive programme! From Zero To Millionaire In Only 2 1/2 Years! Using the principles he teaches, T. Harv Eker went from zero to millionaire in only 2 1/2 years! He combines a unique brand of ‘street-smarts with heart’. T. Harv Eker is the founder and president of Peak Potentials Training, the fastest growing personal development company in North America. Harv’s high-energy, ‘cut-to-the-chase’ style keeps his audience spellbound. His motto is “talk is cheap” and his unique ability is getting people to take “action” in the real world to produce real success. Harv is also the author of the best-selling books, Secrets of the Millionaire Mind and SpeedWealth. He has also developed several highly-acclaimed courses such as The Millionaire Mind Intensive, Life Directions, Wizard Training and Train the Trainer. He is also the producer and trainer of the world-famous Enlightened Warrior Training. The Seating Category (VIP/Premium/General) printed on top of the ticket indicates your seating section. Free seating applies only within your seat category. Business Wear or Smart Casual. Please dress comfortably, making sure you bring a sweater to each session, as the temperature in the conference rooms can fluctuate. NO taping or recording of any session is allowed. There will be breaks for all participants. Food can be purchased within the event venue. No food or drinks are allowed in the hall except bottled drinks. This entry was posted on Friday, June 17th, 2011 at 12:03 am	and is filed under Advertisement. You can follow any responses to this entry through the RSS 2.0 feed. Both comments and pings are currently closed.